I hadn’t planned to write about Talksport’s Alan Brazil and his complaints about cyclists last week. They weren’t really all that hackle-raising, and despite my best efforts, I really couldn’t summon the necessary bile. Indeed I hadn’t even given him much thought at all until I was riding home last week in the cold and needed to drum up some righteous indignation to keep me warm for the last few miles. Essentially he was at the old generalised classifications thing again. He moved from Bradley Wiggins and London 2012 to a badly-focused rant about cyclists failing to wave or otherwise acknowledge his forbearance in not running them off the road, as if these topics were one and the same thing. There was nothing new, and given his 2007 drink-driving conviction, you can be sure that when he complains about behaviour that shows a lack of respect for other road users, you’re getting an expert opinion. But thinking about him thawed out my toes a treat. It was about this point that I glanced over my shoulder. Out of the corner of my eye I saw a cyclist, maybe 200 yards behind. I thought it was my friend Bernard – he often slopes out of work early and rides home down the road I was on – but I didn’t want to look again to check, or he’d know I’d seen him. Instead, I gradually wound up the pace, dropped a little lower over the bars, and was soon ticking along at about 27mph, while making it look nicely casual. As if I rode like this all the time, and certainly not just in response to a friend inching up behind me. It bothered Bernard not one jot. Bernard was still at work, face down on the desk, snoozing in the warmth of his Anglepoise. This guy, on the other hand, came breezing past a mile later in a squealing of un-lubed chain, wearing jeans, boots, a padded jacket, and with a bag slung over his shoulder that in happier times I’d have called a musette, but which was now definitely a man-bag. “Hi,” he said. And he sailed on up the road. I scrabbled to gather what was left of my dignity, but it dribbled through my fingers. But then! Alan Brazil! May God bless and keep him. I too could make a sweeping generalisation. For years I’ve been banging on about what constitutes a ‘real cyclist’. And this man was clearly not a real cyclist. The squeaks, the wrong shoes, the dreadful bag. Here clearly was a runner of red signals, a rider without lights, a hooligan, a member of the underclass, a man who was not one of us. The true advantages of such a classification system had never occurred to me. It’s not just for deciding whom to wave at. I could use it to solve my current difficulty by just ignoring it. My persecutor was not one of us, and was thereby unworthy of notice. He did not exist in my universe. The whole episode had never even happened. If I studied my bar-taping technique carefully, I could even manage not to notice him sliding away towards the horizon. There then occurred a problem. I became aware that I was catching up with the man who did not exist. And having thus classified him, I was going to be unable to enjoy this minor triumph. His shoulders were rocking, and his cadence was dropping, and I wasn’t able to take any pleasure in it. But I figured that Alan had saved me twice already that day. So when I caught the non-existent rider, I passed without any acknowledgement at all. I feel it was just what Alan would have wanted. Winter and early spring training is aimed at three things: improving your physical condition, giving you a confident start to the season, and intimidating friends and rivals. That’s lovely if it works. The problem is that the more miles you rack up in the cold and the ice, the more battered will be your motivation come the warmer weather. Cycling is full of riders who train through the winter, but who by spring can’t face it any more and spend an idle summer laying down blubber. This means they have to train even harder the next winter, and so the spiral goes on. 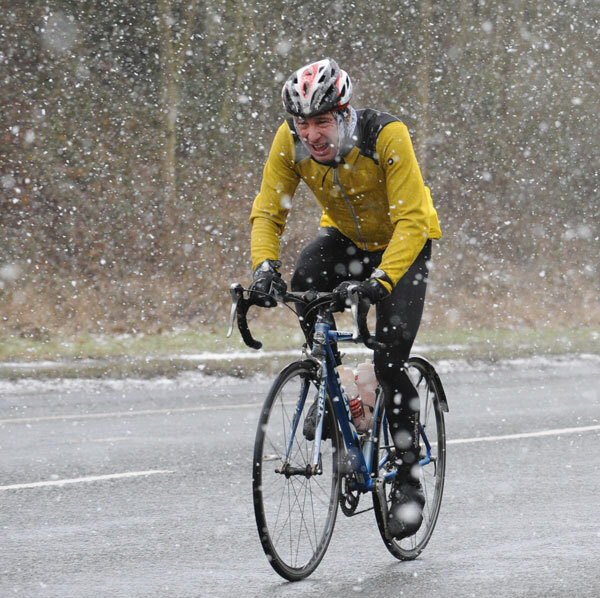 The answer is to extract the most important bits of winter training, and ignore the rest. And the most important bit is the psychological advantage 300 miles a week from November to March will give you over your rivals. So lie, my friends. Lie like cheap rugs. Start a blog, or tweet incessantly about how your regime is costing you a fortune in worn tyres and new trousers to accommodate those ever-expanding quads. Then enjoy the soaring self-confidence that will come from the humbled responses you get from people who can’t dream of doing the sort of training you’re not dreaming of doing either. Just remember that on no account should you go for a bike ride longer than 10 miles until April, and even then, dear heavens, not every week. Luke, you are right. I said after my first 12-hour that it was the most unpleasant thing I’d ever done. And at the time I was sure I was right. Now, of course, I’m able to put it in perspective and say that actually it’s not even nearly the most unpleasant thing I’ve ever done. That honour goes to the second 12-hour I did, in 2003. But it’s still too raw to write about. This article was first published in the February 9 issue of Cycling Weekly. You can also read our magazines on Zinio and download from the Apple store.